Spring Break is a long-standing tradition with people of all ages. Las Vegas is synonymous with partying so one can imagine the madness of Spring Break month. The weather is nice, the clubs are packed and thousands of college students are in town. If you don’t want to wake up with a hangover there are a million other options to fill your night and day. Whether it’s a dinner, show or a day trip to the Grand Canyon, the options are endless. Most people obviously want to chill at the pool and do the nightclubs at night so be sure to check the event calendars and plan accordingly. The best way to enjoy the trip is to pre plan, that way you don’t have to worry once you arrive. 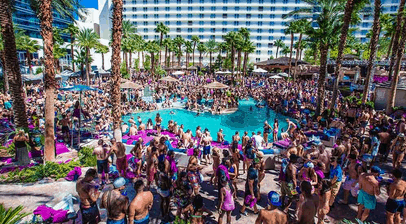 Leading the pool parties this Spring Break is Encore Beach Club and XS Nightclub at the encore hotel. It’s always a good idea to make friends with a good promoter who can help you get in.